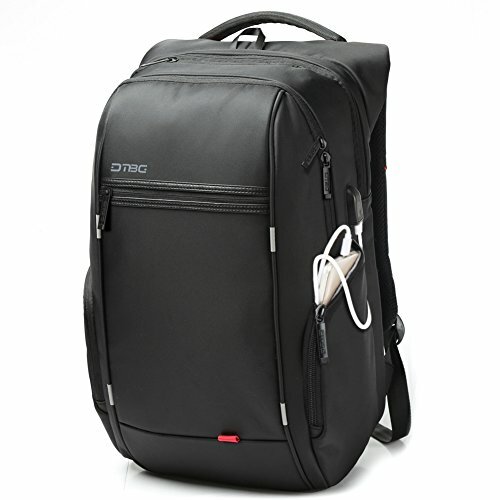 With a USB 2.0 Charging Port extended out the side and well water-resistant design,this is an ideal multi-functional backpack for the daily commute or business travel,or used as a school bag.The backpack with built-in padded laptop compartment provides fashion style and functional organization for everyday use in comfort. -Reflective Tapes,4 points on the front create 360 degrees of reflectivity. -Well water-resistant,that keep inside items dry on rainy day. GOOD PROTECTION -- The backpack is well water-resistant,that keeps inside items dry on the rainy day. Laptop compartment with dual zippered access and thick soft foam padding provides extra protection,that effectively absorbs accidental bumps, reduces damages caused by impacts, and protects your computer from scratches. USB PORT & REFLECTIVE TAPE -- One USB 2.0 Charging Port extened out the right side provides more convenience to charge your phone,tablet PC. 4 points of reflective tapes on the front create 360 degrees of reflectivity. LARGE CAPACITY -- Main compartment is very roomy for big items,such as books,clothes;2 zippered side pockets are suitable for watter bottle,compact umbrella.A ideal small pocket on the top for glasses etc, and on the back, there is a anti-theft zipperd pocket for the valuables. COMFORTABLY-CARRYING SYSTEM -- Airflow back & shoulder straps system,sturdy adjustable shoulder straps and uinque handle for long-time carrying in comfort.The handle is not only for carrying in comfort,but also can be fixed to the trolley suitcase. SIZES -- Exterior:50x35x20CM/19.7x13.8x7.9Inch; Laptop compartment:45x30CM/17.7x11.8Inch. Fits most up to 17.3 inch Laptops,may not snugly fit all computers due to variations in the sizes of different models.